I find this very confusing for collectors. 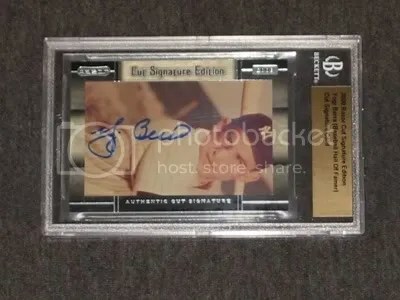 The top image is a Yogi Berra Razor Cut Signature Encore Edition autograph, and the bottom image is a regular autograph from Razor’s first version of Cut Signature Edition. Other than having Mr. Berra sign something different and changing the color of the bar across the top of the holder, they look the same. Even though Razor hasn’t released the print run yet for the Encore set, I have a feeling there are more Berra’s in that product because three have been pulled already. 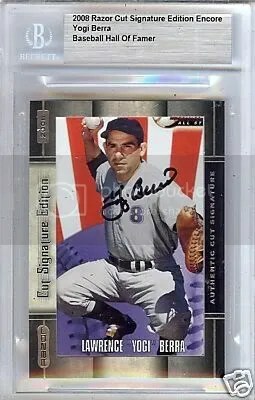 Brian Grey confirmed to me that only five Berra autos are in the first product, and mine is the only one I have seen so far. I don’t think that Razor should have repeated people in their Encore product. If they wanted to repeat people, they should at least change the design of the card a little more.